Citrus brads! We can never have enough brads—they’re an indispensable supply for scrapbooking, card making or any paper craft. Now, this versatile pack gives you a cheerful collection of fresh citrus colors like sunshine yellow, orange, teal, hot pink, raspberry and grass green. You’ll have 20 of each, in standard and mini sizes. 200 brads in all! Stylish silk flowers! Perfect as scrapbook page accents, card focals, at the top of a tag or accenting a mini book—these silk flowers add a bright, fun touch to any papercraft. You’ll have 25 bright red, blue, yellow, green and purple silk flowers in a variety of sizes, ranging from 1” to 4”. Attach them to your paper with a brad or button. 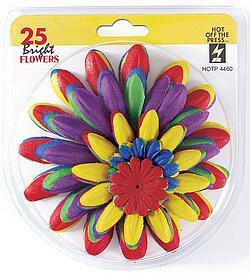 You can also stamp and chalk on these flowers to add even more dimension. Chocolate brads! 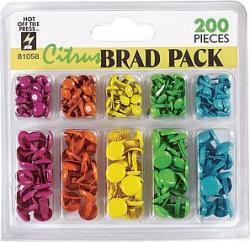 We can never have enough brads—they’re an indispensable supply for scrapbooking, card making or any paper craft. 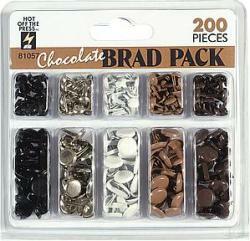 Now, this versatile pack gives you a rich collection of brads in brown, dark brown, black, silver and white. You’ll have 20 of each, in standard and mini sizes. 200 brads in all! Stylish silk flowers! /B>Perfect as scrapbook page accents, card focals, at the top of a tag or accenting a mini book—these silk flowers add a gorgeous touch to any paper craft. Use a single flower, or layer different sizes and colors for more dimension. 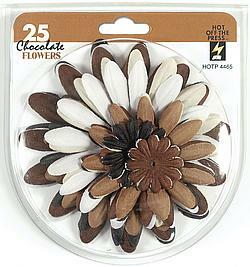 You can also stamp and chalk on these flowers! You’ll have 25 silk flowers in colours like chocolate brown, vintage tan, soft cream, classic black and white in a variety of sizes, ranging from 1" to 4". Attach them to your paper with a brad (our HOTP Chocolate Brad Pack matches perfectly). We love this colour combination for heritage, vintage or special occasion paper crafts.